Snow Mold? What the heck is that? Yesterday a friend of mine on Facebook posted a picture of his lawn. It was very early in the morning and I would guess that he was walking out the door and heading off to work. All the rain and warm temperatures have caused a pretty quick snow melt which is exposing our lawns after a very long winter. So without further ado, here is everything you ever needed to know about Snow Mold (And Probably More). This is an excerpt from a training manual I wrote several years ago. Leaves become water soaked; turn reddish-brown, grass blades are matted together and are covered with a whitish pink mycelial growth that is slimy when wet. When exposed to light, spots may exhibit a pink coloration. Usually kills leaf blades only, unless under extreme conditions. Cold 32 to 45 degrees. Develops under snow if soil is not frozen. High nitrogen fertility in fall. Avoid the use of any chemical fertilizers, especially in Fall. Mow to normal height at end of season. It’s always been assumed by homeowners and turf managers that snow mold was a disease that is completely out of our control. If there is a long stretch of snow cover and the lawn is dormant for an exceptionally long period of time, snow mold would be inevitable. A good rule of thumb is to keep away from excessive applications of nitrogen in the fall and early winter. If the lawn is actively growing when we get a snowstorm you will probably have a problem in the springtime when the snow melts. There are two types of snow mold, gray snow mold and pink snow mold. The gray type appears to be just areas of turf that are matted down and have not yet begun to grow. 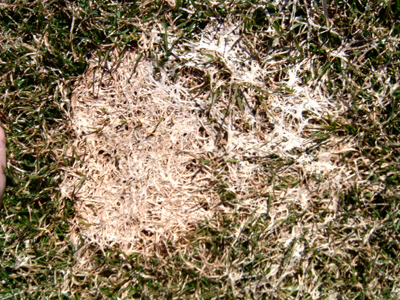 It is inevitable that many of your lawns will have some gray snow mold on them every year. The best thing you can do is to gently rake the affected areas allowing for better air circulation to get through and to help the grass come out of dormancy. Pink snow mold is a little bit different and almost resembles red thread. It is circular patches of pinkish areas and sometimes has a substance that almost looks like cotton candy. There have been years of extended snow cover where snow mold has caused permanent damage to lawns but not very often. The good news is that if your lawn is covered with this particular disease, it will likely grow out and recover one hundred percent. For many years we assumed that snow mold was a simple fact of life that you, as a turf manager (homeowner/service provider) had no control over. If it snowed a lot or if you had an extended period of snow cover you would find your lawn loaded with snow mold come spring time. What we’ve found in recent years is that when you use organic methods to care for your lawn and you decrease substantially the amount of synthetic nitrogen that is applied annually, Snow Mold becomes much less of an issue. The reason for this is that the pathogens that create the disease are much less likely to become visible and active in an environment that is alive with biological activity. Once again, soil that is sterile and void of biological activity is much more likely to be under attack by disease, insect and weed activity. This is not to say that you will never see snow mold ever again but it can be minimized significantly when you employ organic lawn care methodology. « First Day of Spring??? What you say?